So far, the Colette Book Club has read one tear-jerking novel (The Forgotten Seamstress) and one very serious book about the global garment trade (Overdressed). 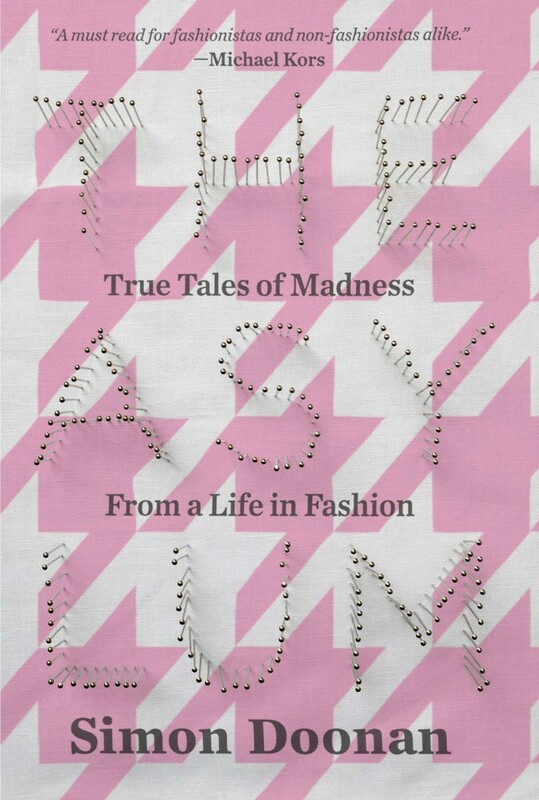 Let’s lighten the mood a little and enjoy the less tragic aspects of fashion with one of my favourite authors, Simon Doonan, and his rollicking memoir The Asylum: True Tales of Madness from a Life in Fashion. Doonan got his start as a window dresser, constructing witty and shocking window displays for Barneys department store in New York. Now he writes books bursting with humour and breezy joie de vivre. I was genuinely torn about which Doonan book to choose. I resolutely believe that every woman should read Eccentric Glamour, Doonan’s gleeful dismissal of good taste, self-consciousness, and conformist beauty ideals. But I picked The Asylum because it’s a celebration of fashion’s oddballs. Sometimes, I need to be reminded that there’s more to fashion than beautiful rich people. There’s also life-affirming weirdness, creativity and almost surreal humour. This rambling memoir is kooky as anything you’ve seen on the runway. There’s something to entertain—and offend—almost everyone. The Asylum is available at bookstores and (probably) your local library. It’s also available for Kindle, Nook and Kobo. We’ll discuss the book on this blog, six weeks from now, on May 12th. We’ll announce the next book on the same day. Between discussion posts, you can chat about the book using the hashtag #ColetteBookClub. This book also goes by the title “The Asylum: A Collage Of Couture Reminiscences…and Hysteria,” at least in Canada. That’s the title of the edition in my local library system and at Chapters. Thanks Susan! For some reason, lots of Doonan’s books have multiple titles and it can make things a bit confusing. But they’re all worth reading! Thanks Susan! For some reason, many of Doonan’s books have multiple titles which makes it confusing. But they’re all worth reading (and re-reading) so I’d say just request all the Doonan books your library has and read them all. I would live to join in, I have read the previous 2 books with you, but I can’t find this one on kindle at all. There are 3 by Doonan that I can see, Eccentric Glamour, Selby something and Gay Men Don’t Get Fat. If I can’t work it out I will read the glamour one. I am in the UK. Great reads so far, BTW. I am enjoying trying new things. I just ordered a used copy! I’m very curious to read this one; I’m not familiar with Doonan or his work. I’m really enjoying this book club and how varied the selections have been so far. I would like to thank you for this very clever bookclub! I read the previous two books, and the club incouraged me to find time to read during a very stressful and challenging time in my life. Without the club I probably wouldn’t be able to prioritize reading. Aw, thanks Roni! It’s an experiment for us as well and I’m really pleased with how well it’s going. I’m glad it’s working for you so far! Wow, I’m so clueless, I had no idea he had written so many books. I think I just ordered all of them from half.com. I love Simon Doonan, so I can’t wait to get started! I’m really keen to keep on reading these book club titles you are finding for us. It is a pleasure to be part of a group of humans all reading and commenting on something I am following. I like to read on my smart phone which comes with me everywhere I go. Sadly, I don’t seem to be able to get Asylum as an e-book :-(. There is a Barnes & Nobles app called NOOK which carries it BUT you have to pay quite a lot for the app before even buying the book. The reviews of NOOK that I have read suggest it is not nearly as user friendly as other apps.